The effects of several missing teeth go beyond the form and function of the lost teeth. 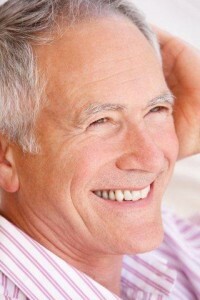 Bone loss will occur when missing teeth are not replaced, which leads to the shrinking or sinking appearance in the mouth and cheek areas; shrunken facial contours can make you look a lot older than you actually are, which is why it is very important to address missing teeth concerns as soon as possible. Life Dental Implants in London offers much youthful smiles with dental implants and implant-supported dental bridges or dentures, which provide the form and function of the natural teeth that have been lost. Dental implants ensure that dental bridges or dentures are attached securely into the jawbone; the dental implants will also prevent the occurrence of further bone loss, which is the culprit that can shrink facial contours – resulting in a much older appearance. You can enjoy your youthful looks longer by choosing dental implants and implant-supported dental bridges and dentures to address missing teeth concerns. Dental implants can make you look and feel better about your appearance, and can help you enjoy the youth that you thought you had previously lost for a longer period of time.